The Dow has gained nearly 3,500 points in six consecutive weeks of gains. The Dow managed to stay positive most of the day with a +184-point rally on the morning economic reports. A little post earnings depression and some light weekend event risk pushed it slightly negative, but buyers were waiting, and the index closed above 25,000. The Nasdaq never had a chance with Amazon losing 92 points. I am surprised the index made it into positive territory in the morning given the Amazon drag. Amazon was responsible for 37 Nasdaq points and Microsoft was second on the anchor list at 10 Nasdaq points. There were quite a few economic reports for a Friday because several had been postponed during the shutdown. 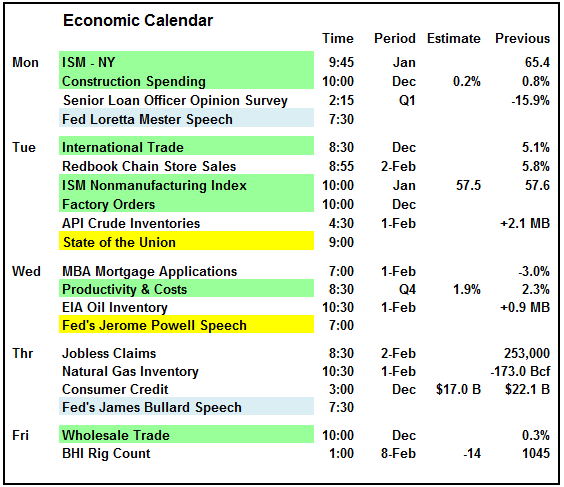 The calendar for next week is a moving target with Moody's showing one set of dates and Econoday and Bloomberg showing different dates. Hopefully after we get past next week all the reports will reset to their normal schedules. 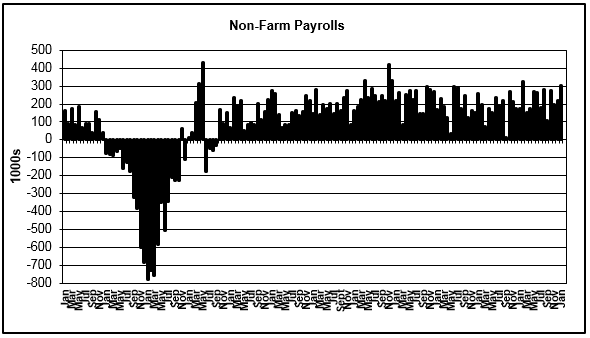 The first major report for Friday was the Nonfarm Payrolls. The economy created 304,000 jobs and well over the latest estimate for 160,000. However, the blowout 312,000 number from December was revised down to 222,000 and the November gain of 176,000 was revised up to 196,000 for a net drop of 70,000 jobs due to revisions. Goods producing jobs rose 72,000 and service jobs rose 232,000. The unemployment rate rose to 4.0% because more people entered the workforce thanks to available jobs and higher wages. Government workers were classified as unemployed even though they were still employed and just on furlough. Average hourly earnings rose 0.1% and the workweek was flat at 34.5 hours. Construction jobs rose 52,000, healthcare jobs rose 42,000, leisure and hospitality added 74,000 jobs, transportation and warehousing added 27,000 and retail rose by 21,000. Personal and businesses services rose 30,000 and manufacturing added 13,000. The headline numbers and percentages were impacted by the annual full-year revisions. Each January the government looks back at the yearly releases and the adjustments in the following months and produces a "final revision" for the year. The impact this year was negligible. January was the 100th consecutive month of job gains and the pace seems to be growing stronger. The 3-month moving average after the revisions is now 241,000. Because of the impact of the government shutdown we could see a dramatic shift in the February report, assuming another shutdown does not occur on February 16th. 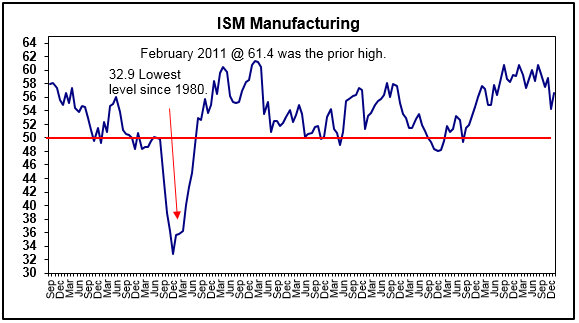 The ISM Manufacturing Index for January rebounded from 54.1 to 56.6. Analysts were expecting a repeat of the 54.1. This is very good news for all those analysts worried about a 2019 economic decline. The new order component rose from 51.3 to 58.2 but order backlogs barely changed at 50.0 to 50.3. Production rose from 54.1 to 60.5. The two best components were prices paid, which declined from 54.9 to 49.6 and customer inventories rising only slightly from 41.7 to 42.8. Prices paid fell into contraction territory and indicates no inflation on the horizon and no fear of a Fed rate hike. Prices paid hit 76 back in June so this is a significant decline and very good for manufacturers. The customer inventories remain very low and suggest continued strength in manufacturing as companies replenish their stocks. 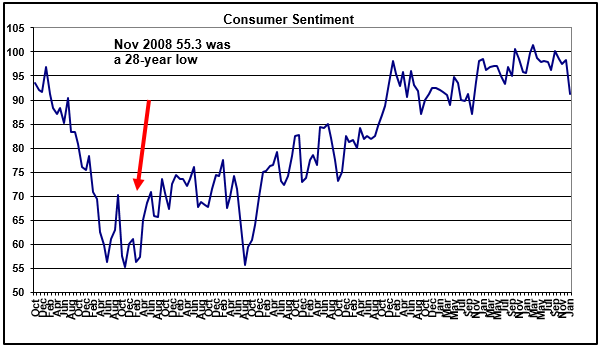 Consumer sentiment was little changed from the initial January reading. The headline number rose from 90.7 to 91.2 in the revision but that was still a 7-point decline from the 98.3 in December. That was the largest monthly decline since December 2012. With the longest partial government shutdown in history, worries over Chinese tariffs and the December market crash, I am surprised it was not worse. February should show a significant improvement assuming there is not a second shutdown. Construction spending for November posted a stronger than expected rise of 0.8%. Analysts were expecting +0.3% after a previously reported decline of -0.1% in October. That was revised higher to +0.1%. Private residential construction rose 3.5% and was responsible for the headline gain. Public construction declined -0.9%. Overall construction spending is up 3.4% YoY and public construction is up 7.0%. Wholesale inventories rose 0.3% in November, compared to estimates for 0.5% and a 0.8% gain in October. The inventory levels are being impacted by the tariffs on Chinese goods and the expectations they could be boosted to 25% on March 1st. Vehicle sales slumped in January to an annualized pace of 16.7 million. With the government shutdown in place for most of the month and brutal cold weather it should not be a shock that sales suffered. Light truck sales were the hardest hit falling from 12.2 million to 11.3 million annualized. The frequency of economic reports declines sharply next week as the backlog of missed reports dwindles. The ISM Nonmanufacturing and Factory orders are the most important reports. Fed Chair Powell will speak on Wednesday and that will always be important for the market. If he is smart, he will try to avoid any market moving comments and not disrupt the current rally. The State of the Union is Tuesday evening and that is sure to touch on a lot of topics and further increase political divisiveness. Ironically, the topic of the speech is supposedly "Unity." This will be the full use of the bully pulpit in a last-ditch effort to get funding for border security before being forced to declare a national emergency. Republicans will be cheering, and democrats will be putting their lawyers phone numbers on speed dial in case it actually happens. The speech should not have any material impact on the market. Some 234 S&P companies have reported earnings with the current blended forecast for Q4 at 15.5% and 6.2% revenue growth. Unfortunately, the forecast for Q1 is dropping rapidly. Last month the forecast was for 8% growth and that has declined to only 0.7% growth. Net income estimates have turned negative at -1.6% and dropping sharply. This is going to get the market's attention very soon and it may not be pretty. If earnings are declining, the "E" in PE, then prices "P" will also decline. Next week will see 97 S&P companies report. As you can see by the graphic below the number of high-profile companies has shrunk significantly. The earnings peak was last week, and it is downhill from here. There are still a lot of big cap companies to report but they are not names you hear every day. We are moving into mid-cap week and next week we will see the small cap sector begin to report. We are nearing the point in the cycle where post earnings depression will begin to appear. We are already seeing it in the Dow, and we could see it in the Nasdaq next week. However, it is normally expiration week when the weakness really begins to appear. 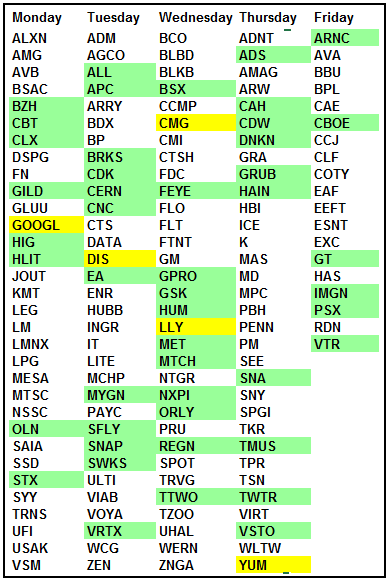 Friday is not normally a big earnings day, but this cycle was heavier than most. 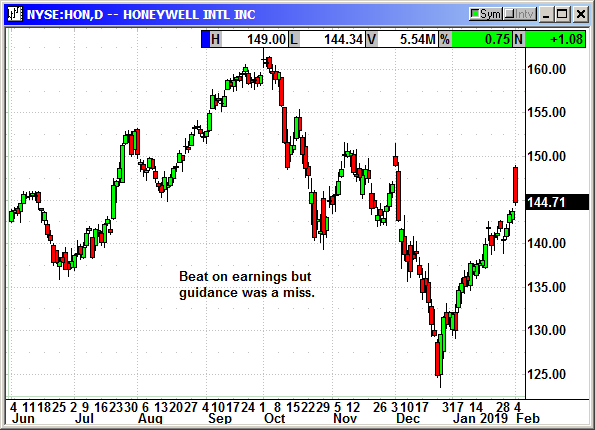 Honeywell (HON) got off to a good start at the open but ran out of steam in the rapidly fading market. The company reported earnings of $1.91 that beat estimates for $1.89. Revenue declined 10% to $9.73 billion due to the spinoff of its transportation systems but still beat estimates for $9.70 billion. They guided for 2019 for earnings of $7.80-$8.10 on revenue of $36.0-$36.9 billion. Analysts were expecting $7.86 and $37.07 billion. Honeywell said strength in aerospace, defense and warehouse automation led to the strong earnings. Shares were up $6 at the open but faded to a $1 gain. 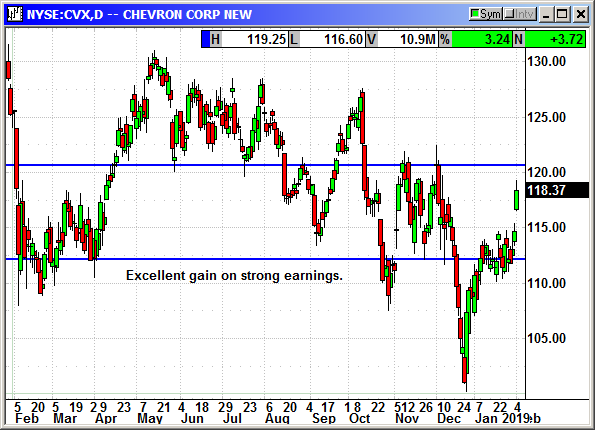 Chevron (CVX) reported earnings of $1.95 that beat estimates for $1.87 despite the falling oil prices in Q4. Revenue rose from $37.6 billion to $42.4 billion but narrowly missed estimates for $42.5 billion. Net production rose 7% to 2.93 million Boepd. They guided for 2019 production to rise 4-7%. 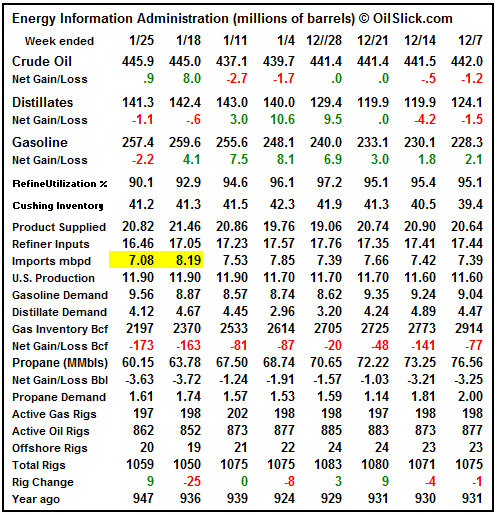 They added 1.46 billion barrels of reserves in 2018. They repurchased $1 billion in shares in Q4 and increased the dividend by 7 cents to $1.19. They produced an average of 338,000 Boepd from the Permian and expect to increase that to 600,000 bpd by the end of 2022. Bloomberg reported that Chevron had approved a $25 billion stock buyback program, but I could not find that in Chevron filings. Chevron said earlier in the week it was buying a Pasadena Texas refinery for $350 million from Brazil based Petrobras. Chevron is looking for a home for all that Permian oil they are shipping to the Gulf. Running it through their own refinery will increase their profits. 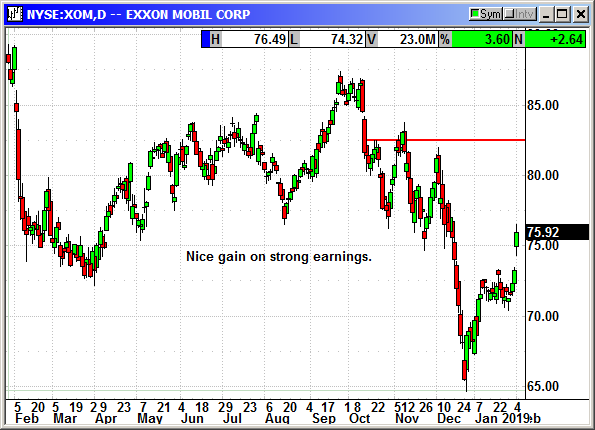 Exxon Mobil (XOM) reported earnings of $1.41 that easily beat estimates for $1.08. Revenue rose from $66.52 billion to $71.9 billion but missed estimates for $72.53 billion. Production rose to 4.01 million Boepd and beat estimates for 4.0 million. Exxon said its capital budget for 2019 is $30 billion, a 16% increase over 2018. Most of the spending will be on deep water and LNG projects. 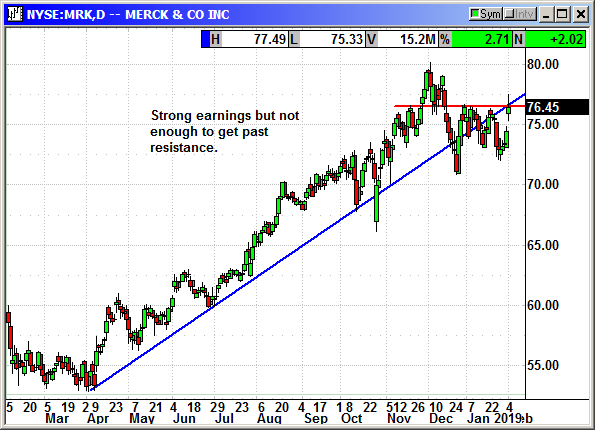 Merck reported earnings of $1.04 that beat estimates by a penny. Revenue rose 5% to $10.99 billion and beat estimates for $10.95 billion. Sales of Keytruda rose 66% to $2.15 billion. They guided for 2019 earnings of $4.57-$4.72 on revenue of $43.2-$44.7 billion. Analysts were expecting $4.69 and $44.2 billion. Shares rallied $2 back to resistance at $76.50. Currency issues lowered revenue by 3%. Keytruda was not the only drug winner. Gardasil, an HPV vaccine, saw sales rise 32% to $835 million. Bridon, Pneumovax and ProQuad all saw strong double-digit sales gains. Discussing earnings would not be complete without talking about Amazon. The company reported earnings of $6.04 that beat estimates for $5.65. Revenue of $72.4 billion beat estimates for $71.88 billion. Investors were not impressed. The company guided for Q1 revenue of $56-$60 billion and analysts expected $60.83 billion. Even with the lowered revenue forecast it would still be an increase of 10-18% in a normally slow quarter. The company also said spending will increase at a significantly faster rate as they accelerate the process on HQ2 and other endeavors. Shares fell $92. Investors should remember that Amazon went for years with no profits under the "build it and they will come" theory. Consumers arrived in record numbers. Annual profits in 2017 were $3 billion and that jumped to more than $10 billion in 2018. How many companies are increasing profits that quickly? In retrospect 2018 was the result of all that capital investment in 2016-2017. This was the beginning of the payoff. Now Amazon is planning on spending another $10-$20 billion on their next round of investments. Amazon is still digesting the Whole Foods purchase. Revenue from its physical stores, which total about 500, declined 3% to $4.4 billion. This is growing pains as they try out multiple formats of retail locations in addition to Whole Foods. Actually, when adjusting the reporting calendar for Whole Foods to match Amazon's, sales were up 6%. Amazon Web Services revenue rose 45% to $7.43 billion and operating income rose 61% to $2.18 billion. Revenue growth in its advertising business rose 95% to $3.39 billion. For the full year advertising revenue more than doubled from $4.65 billion to $10 billion. Amazon is suffering from the law of large numbers. When revenue was $7 billion a quarter, raising it to $10 billion (+43%) was not that big of a jump given the total addressable market. The market was fertile and Prime subscriptions were small. Now that revenue is $72 billion and nearly every online shopper in America is a Prime subscriber, it is harder to move the needle. A 43% jump in Q4 revenue would mean a $31 billion increase. That is larger than the market cap of most S&P companies. The jump in package volume would almost need another UPS to deliver them. In order to continue growing, Amazon is reaching out into other areas besides online shopping and to areas where online shopping has not taken hold. They mentioned a big spend in India where they are trying to establish a beachhead. There are 1.4 billion people in India compared to 330 million in the USA. If they are successful in dominating online market share in India, they could easily double existing revenue in 3-5 years. Of course, they are fighting the Alibaba companies on what could be considered home turf. 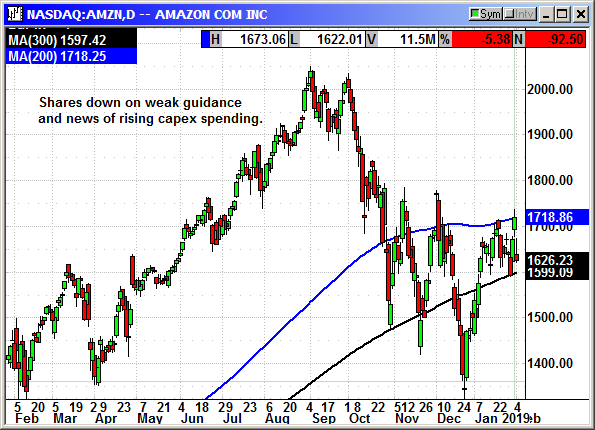 I would not be a buyer of Amazon today because we could see a drop back to $1,500 on post earnings depression. However, I would buy it for a long-term hold. This is a dynamic company with plenty of ideas that will keep them on top with new businesses for the next decade. There are analysts who believe shares will double or triple by 2025. Buy the dip to $1,500 or even $1,400 and then forget you own it. If you watch the big swings in the future, you will be tempted to sell and hate yourself later. 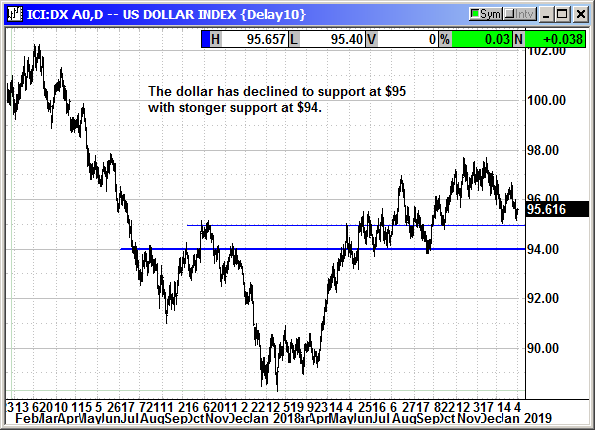 With the Fed out of the picture short-term, the dollar has declined back to support at 95 on the Dollar Index. With expectations for only one rate hike in late 2019, the dollar is losing ground. While that is good for earnings at American companies doing business overseas, it is a pressure in other areas. Our buying power is shrinking. Support at the $94 level is likely to hold as long as the economic numbers continue to improve. Additional employment reports like we saw on Friday will have the Fed coming back to the table with hikes, sooner rather than later. The falling dollar means a rise in the price of gold. The yellow metal is heading back to resistance at $1,360 and that should equate to about $94 on the Dollar Index. The weak global economy is also prompting gold buying as a store of value. The prior week the Bank of England refused to give Venezuelan president Maduro $1.2 billion in gold on deposit there. Last week the US stopped a shipment of $850 million in gold (20 tons) from leaving Venezuela headed for the UAE. The threat of sanctions against any person, company, airline or charter jet, caused the deal to blow up before the gold could be loaded. The Russian plane left empty. In theory, the gold was supposed to be purchased by a company in the UAE for euros in order to provide some liquidity to Venezuela. In reality, many thought Maduro was trying to move his retirement funds out of the country before he leaves the country for good. 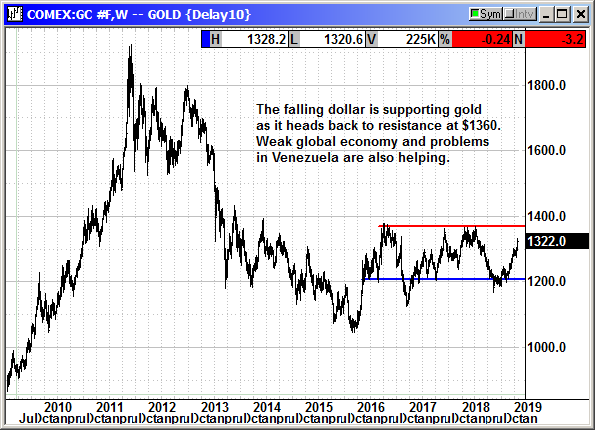 The constant headlines about Venezuelan gold helped to support gold prices. 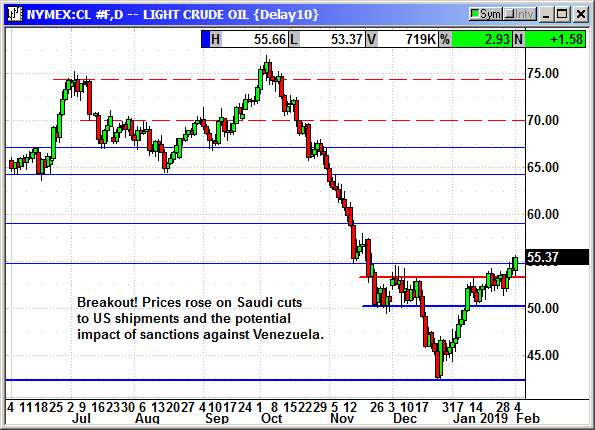 Crude prices rallied back above $55 on news the US had sanctioned oil from Venezuela. US imports fell more than one million barrels per day because it is now illegal to make payments to Venezuela. The sanctions prevent American companies from doing business with PDVSA, the Venezuelan oil company. We normally import about 500,000 bpd from PDVSA. Venezuela has another problem in selling that oil. The heavy oil must be blended with a lighter oil before it can be refined. Normally that happens in the US but that option is no longer available to PDVSA. If they try to sell the oil to other countries, there are very few refineries that have the capability of processing this heavy crude. That means PDVSA will have to sell it at a steep discount and then wait a month to get paid while the oil is in transport. Venezuela only exports in volume to three large countries, Russia, China and the USA. The US is the only country that pays for the oil and therefore their only source of hard currency, dollars. China and Russia loaned the country money over the last several years and they are taking oil in place of payments. That means Venezuela, desperately in need of hard cash, cannot send oil to Russia or China because they get nothing in return. The US has crippled the Maduro regime, and this will force a further slowdown in production because there is no place to put the oil and no cash to pay the workers. 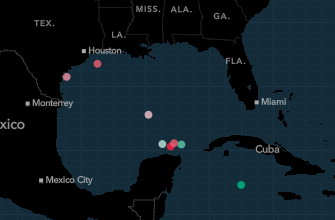 Bloomberg reported this weekend there are tankers holding about six million barrels of Venezuelan oil parked in the Gulf of Mexico with no place to go. Eight ships are either parked or heading to a holding pattern. Four days ago, news broadcasts were telling people to turn off all non-essential natural gas appliances and heaters because of low pressure in the lines and insufficient supplies. The Polar Vortex was killing people with sub-zero cold. 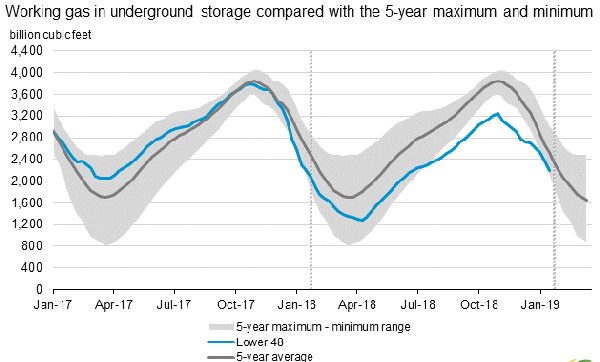 Three days ago, forecasters predicted a significant thaw for this coming week and natural gas prices crashed to a seven month low. This drop came with the country still in the grip of winter and gas supplies well below the 5-year average. 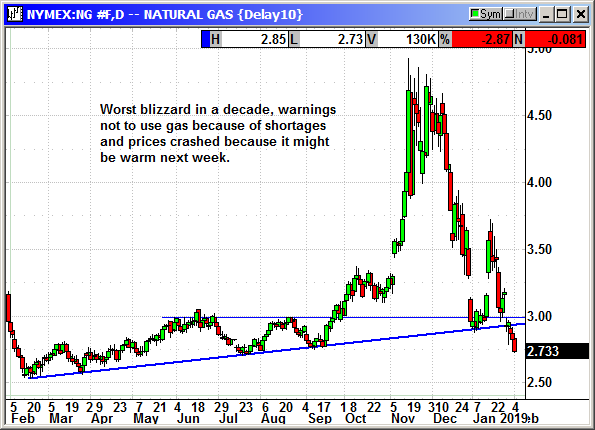 Gas supplies will probably decline by 10% when reported next Thursday. If we had 2-3 more weeks of significant cold, we could see significant supply shortages. With only 2,197 Bcf in storage and the potential for a -250 Bcf decline next week we are reaching critical levels and prices are crashing. If you want logic you won't find it in the commodity market. I don't want to be the writer that cried wolf or the equivalent of Chicken Little, but the Dow and Nasdaq have been up for six consecutive weeks. The Dow has rebounded 3,500 points at the intraday high on Friday. Long lasting "V" bottoms are very rare. Q1 earnings forecasts are about to turn negative. Post earnings depression is coming. By any measure the current rebound is overbought. 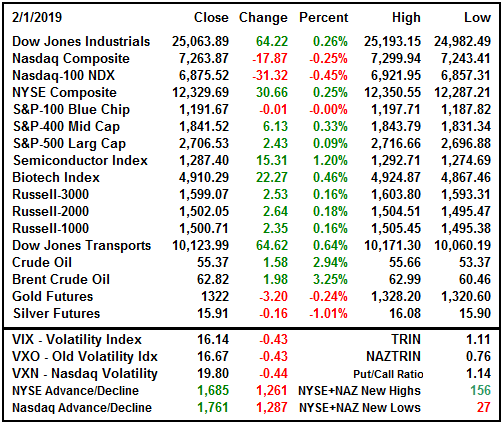 The only thing keeping this market positive is the extreme oversold conditions in December and the potential for a China Trade deal. The oversold conditions from December have nearly equalized. We are overdue for a meaningful dip. I am not predicting a 1,000-point decline but simply a decline that last more than a day or two and allows some traders to take profits while portfolio managers get an opportunity to enter positions they missed on the initial rebound. If I had told you on December 26th to buy everything in sight because the market was going to rebound straight up for the next six weeks you would have thought I was crazy. This kind of V bottom rarely happens. The trade war with China knocked a lot of points off the market in 2018. 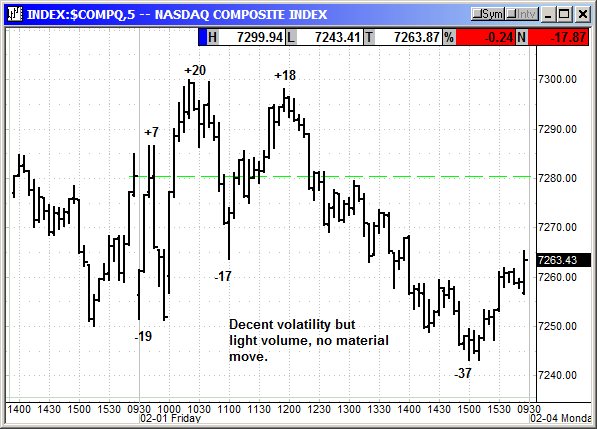 It has been a nearly daily pain in the neck with headlines and tweets that increased volatility. October was especially painful. Everyone has bought the dip on the hope of a resolution. The meeting last week was positive, and it appears Trump and Xi will meet at the end of February to sign a major trade agreement. This is the perfect sell the news event. An agreement is already priced into the market. The actual results of the agreement will take months if not years to be felt in the economy. The only immediate part will be a headline about the removal of the tariffs. The market will likely spike on the announcement and then roll over for lack of other news. March is typically a slow month with investors liquidating positions to raise money to pay their taxes. 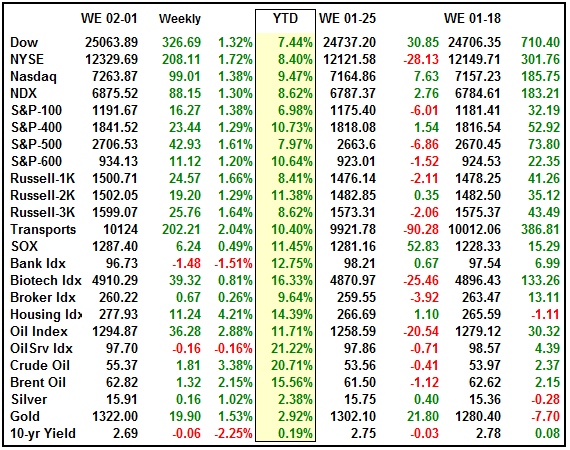 If an agreement is reached in the last week of February, there may be no headlines left to hold the market up in March. I really hope that I am wrong on this prediction. We may not make it until the end of February. There is a market adage that says, "As January goes, so goes the year." Since 1957 January has been up 37 times. Of those 37 times the market has been up for the year 32 times. That is a remarkable record with an 86% success rate. However, of those 37 times, February has only been up 55% of the time or 20 years. Basically, a coin toss. You may remember February 2018. Markets do not have a memory, but humans do, and events tend to repeat. 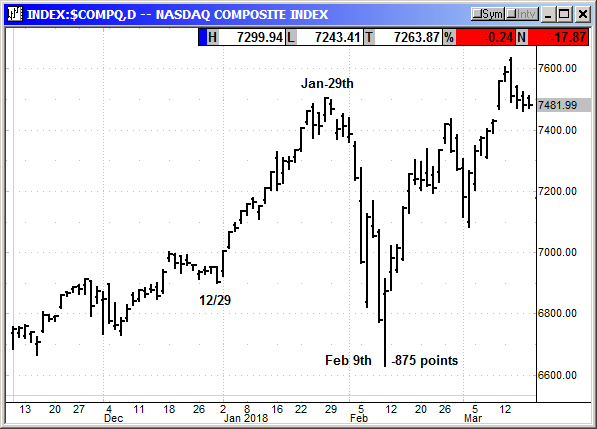 The Nasdaq hit a high on January 29th and nine trading days later it had lost -875 points. The S&P lost -341 points and the Dow -3256. I am not predicting this, but I do think we should pay attention. The Chinese trade deal could keep investors interested in the market but once it has been announced, there may not be another carrot to chase. Add in the potential for Q1 earnings forecasts to turn negative and that is an added incentive to be cautious. The S&P finally made it through the resistance at 2,650 and closed just over resistance at 2,700. 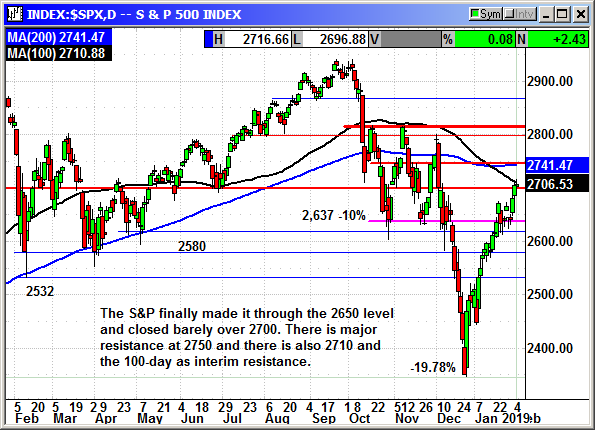 The 100-day average at 2,710 is current resistance but the 2,700 level is still in play. The next 100 points could be tough, but the 2800-2815 level is the clear target and that will be the next goal. 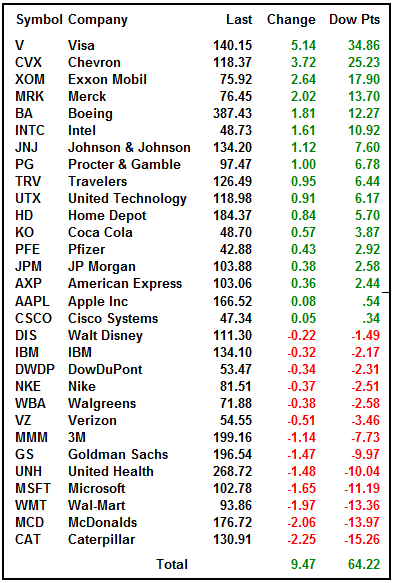 The Dow closed positive solely on the strength of the earnings winners from Friday. Chevron, Exxon and Merck added 57 points and Wednesday's winner Visa added 34 points. Note that prior winners from several days ago, CAT, MCD, MSFT and MMM were at the bottom of the list with post earnings depression. 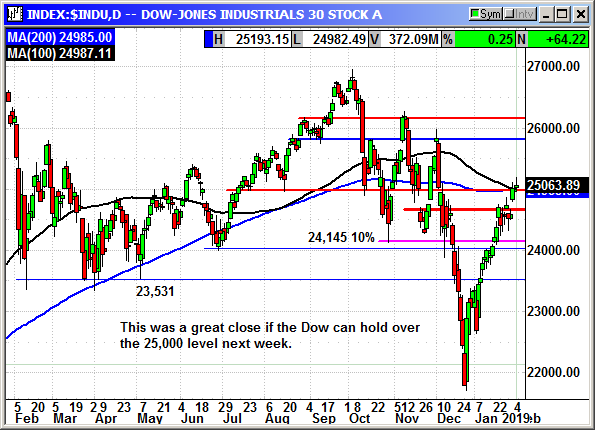 The Dow gain of 64 points was just enough to close the index over 25,000 and the 100-day and 200-day at 24,986. If the Dow can hold these gains over those levels, it would be very bullish. Should it drop back below 25,000 the round number resistance would gain strength. I believe Disney is the only Dow component to report next week. Amazon was the big drag on the Nasdaq with the $92 decline erasing 37 points from the Nasdaq index. 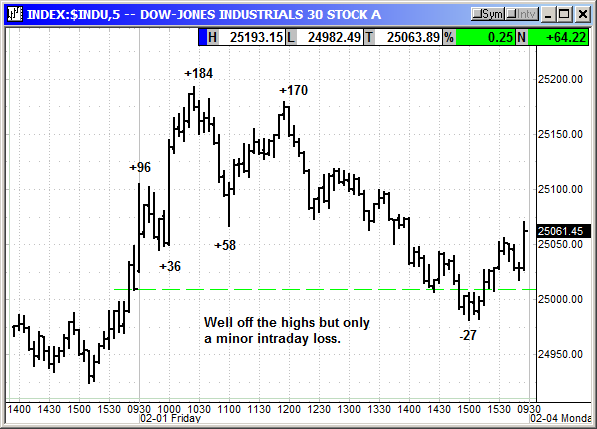 It was the only stock to trade with a double-digit gain or loss. 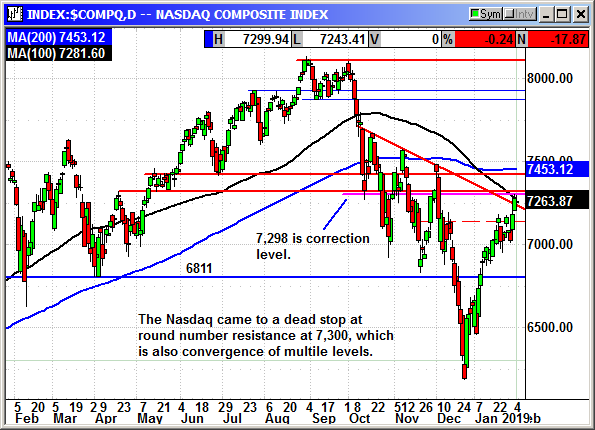 The index has round number resistance at 7,300 and the high for the day was 7299.94. You cannot get much closer than that. The 10% correction level is 7,298 and the 100-day at 7,281. Alphabet (GOOGL) is the big dog reporting on Monday and they are expected to beat estimates. Whether the stock will rally is of course unknown. Since there are two $1,100 Google stocks, their earnings impact is doubled. Every $1 move in the stock is worth about a quarter of a Nasdaq point. 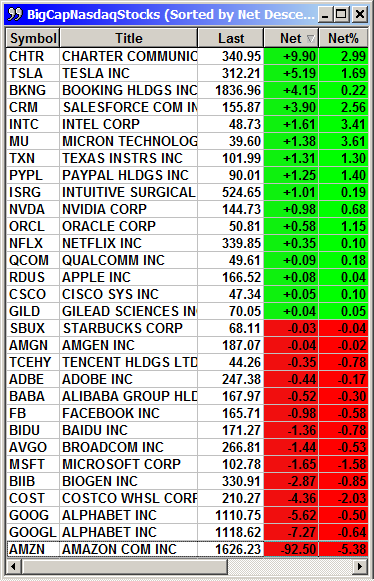 A $12 move in each stock ($24) would be the equivalent of 6 points on the Nasdaq. A $10 move in Amazon is worth 4 Nasdaq points. 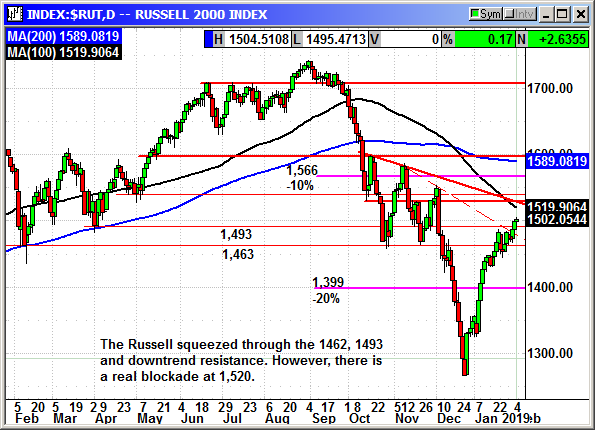 The Russell 2000 finally pushed through resistance at 1,493 and even closed over 1,500. However, there is a real blockade at 1,520 where multiple resistance levels converge. With small cap earnings still a week away there may be enough interest to keep the index moving higher to that 1,520 level. I probably do not need to write a summary paragraph today because I made my feelings known. However, those are just my concerns and they have nothing to do with the market. I could be entirely off the mark. I would simply like everyone to understand what could happen and be aware. If it does not happen, I am sure everyone will be thrilled with another week or two of gains. Unfortunately, we are still undergoing some challenges after our server failure last week. We are working diligently to get them corrected. Please be patient if there is an interruption in your email delivery. You can always go to the website to access the newsletter content. "A democracy will continue to exist up until that time the voters discover they can vote themselves generous gifts from the public treasury. From that moment on, the majority always votes for the candidates who promise the most benefits from the public treasury, with the result that every democracy will finally collapse due to loose fiscal policy, which is always followed by a dictatorship."